Gene's World: Breaking News from Warranty Rewards! - The Matrix Protection Plan now includes Accidental Damage Handling Coverage! Breaking News from Warranty Rewards! Warranty Rewards President and Co-Founder, Yoni Ashurov just announced that starting May 1st 2014, all new customers of the Matrix Protection Plan now have the option to add on an ADH, or Accidental Damage Handling Coverage, for just $5 more per month that covers two devices. This ADH Coverage applies to cell phones, tablets and laptops that are in good working condition at the time of their registration and protects against spills, drops, cracks and other common accidents. Ashurov stated on a company conference call that this plan is “Industry disrupting… of the warranty industry in America. There is no product out there in the market today that will give you Accidental Coverage on existing devices”. The company will soon be releasing the ADH Coverage add-on to their current Matrix Protection Plan customers and Warranty Rewards Agents. Warranty Rewards is helping to revolutionize the extended service and repair industry! Traditional service plans purchased at big box electronic stores or online are of a limited time period and require the consumer to pay large upfront premiums for each consumer device protected. With Warranty Rewards and the Matrix Protection Plan, you are able to cover all of your eligible electronic devices for an unlimited time, new or refurbished, with one low fixed monthly fee of $24.95! As well as the addition of the Accidental Damage Handling Coverage for just $5.00 more per month that covers two mobile devices. Warranty Rewards was founded as the direct selling arm of Matrix Protection, one of America's premier providers of underwritten aftermarket service plans. Our revolutionary programs, created by seasoned industry professionals, provide consumers with comprehensive, month-to-month protection plans at affordable fixed monthly rates. 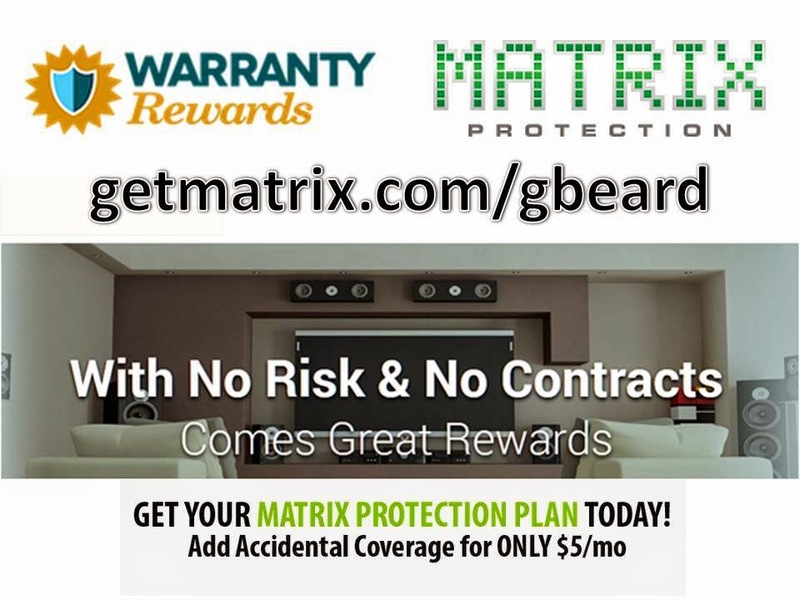 For more information about the Matrix Protect Plan please visit www.getmatrix.com/gbeard or call 813-421-1572.